It has often been said and shown that music often sets a tone in our lives, just as being involved in activities of common nature between people. That is being said because we are to have a personal, one-on-one relationship with our Saviour – that makes His desires our desires, that common nature to do what He would do. The influences in our lives are far deeper than what can be detected on the outside, the permeation into the very fabric of who we are and who we want to be. The reason that it did so is because the Word of God, His VERY Breath, was already hidden in my heart – the eXact verse came to my mind. The music/hymn triggered in me to sing it, but do NOT stop there – it was a starting place, not a replacement – a launching pad for developing this Series. That launch got me to look up one of my favorite singers for that particular song, Wintley Phipps, where he shared a statement that it reminded him to share. This Series is directly built upon picking apart the words of this statement – looking through God’s Word to find the pieces which would help me, any Christian, understand that through all circumstances, trials and measures, we CAN and SHOULD depend on the Bible as our written Guide. The further the searches took me, the more verses of Scripture became alive to the very ability for us to say, along with the Shunammite woman, It Is Well. While this could be seen as a negative burden, it should be seen as a triumphant call to the Brethren to hold dear the Scriptures, renew ourselves to listen to the small, quiet voice of the Holy Spirit and seek in His Word those things when recalled cause us to draw closer to our Saviour. There are fifty-one (51) prints for this Series, which makes it EXTENSIVE, but the basis of the Series is more concise. A HYMN started this Series and a study of passages to both Encourage and Empower us to search God’s Word for Answers and strengthen our Relationship with our Saviour. Theme | Is it Well? It is Well. O My Soul. What will be the item that makes you recall a “hidden” verse of Scripture in your heart? It does not have to be a traumatic event to do so – it is my hope and prayer that is not the only time we’d be willing to turn to our Heavenly Father. Today’s world focuses on the most tragic events to have Christians make the turn to the Creator for assistance. It should not take that kind of “event” for us to want to draw nigh to our God and Lord, Relationships require daily work and nurturing to be effective and have the close bond they were engineered to foster. One of the ways my time is shown and my Relationship is allowed to grow is through Series like this one that I’m SO blessed to be able to share. Will you SHARE today what the LORD has done for you? Can you simply brag on your Creator for being SO good to you today? 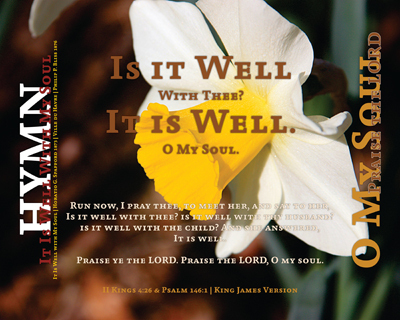 Indeed, It Is Well, It Is Well With My Soul! For those that keep up/follow me on any regular basis will have already quickly picked up on the return to the statements, Scripture and sayings that have a distinct sentences and thoughts that appear due to highlighting. This one for Job, from the Bible, is an INCREDIBLE example of needing to have a solid, exacting phrase – or what I’d like to refer to as Holy Spirit answering to a quiet meditation time on a matter needing a desperate answer. No question in my mind, enough volume has been squarely placed in my bowl with this one that a book could be written about this meal. Not only is there the Statements to consider, but also biblical support to show through to each that would consider asking Our Heavenly Father to illuminate the eye-gate of our hearts to listen to Him Speak. 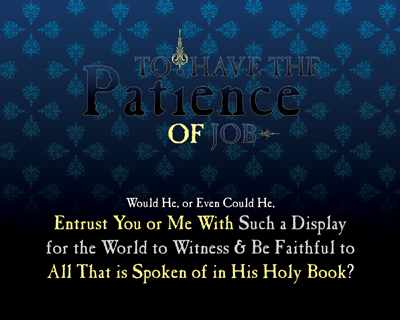 As we consider His Servant Job, it would do us well to take a deep look into why we have lack of patience. It is my inclination that we are suffering from the lack of compassion – we are missing the inner man, the person who God the Father see’s in others and in ourselves. God knew that Job would withstand, that the very metal of his existence would be tested, verified and made perfect. Even when Job had no idea what was happening, we get the benefit of God’s Triumph through His choice Servant as we have the complete story to read, study and make application of in our lives. Would we prove to be so purified by such demonstration? Could you and I choose to do so – and – see God’s Blessing, Mercy and Purity in the throws thereof? 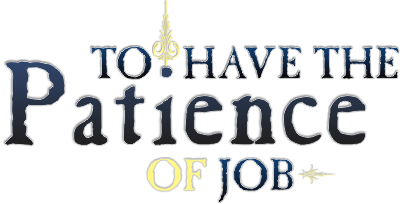 There are several items to consider with this Series, with each being a building block on the other, as well as a support structure for understanding how Job’s patience was built out of adversity. Each step, part and piece of the process, as horrific as we may see them, were the fashion in which God chose to show us Patience through a Choice Servant, Job. First Question: Would He, or Even Could He? Responsibility: Such a Display for the World to Witness & Be Faithful to? It is OUR responsibility to share our Faith with others, right? All those GOOD things that we are SO Blessed to have given us and presented to us… as if we deserved them, right? This Series is MUCH more than that, it is a display of being able to be Forged by our Creator, even while going through the most desperate of measures, coming out on the other end of that trial, difficulty or challenge, showing forth as Precious and Refined – an example for others who may and are likely watching your every move, attitude, disposition and responses. A Series like this is an amazing thing for me – one where I get to enjoy a really good, deep study and for the Holy Spirit to stir within me a creative idea which God the Father places a new opportunity to share His Word with others in a different avenue. First want to share this Series with you from a “Quote” perspective. The exact same Quote set is being presented several different ways and then is being incorporated into the enveloping process of a DeliverTheWord.com Series. It began by seeing a “like” on Social Media for a Website that specialized in Wall Quotes and a simple “wish” of having one of them. In digging around, the exact same quote was listed on several different sites in like fashion – and of course so were the price “selections”! Yikes! The three words seemed innocent enough and there were no formal explanations given anywhere that was come across in the search. Something surprised me though, there were no definitions or biblical backing for any of them either. Was there supposed to be something inferred or understood, or could this be to presented to begin a conversation? Followed soon by, “I’d like to have one of them too!” My reply at the identical time was “What size would you like that in?” Had to take a few second backup to ponder what had just happened. A conversation had just begun – and ALL three of the participants were Christian’s! Could barely stand to be “beside” myself – even at a GREAT distance apart, three people KNEW Who Gave them their Home, Who we HONOR with our Family and Who we RECEIVE Blessings from – our Heavenly Father. Just look – HOME, FAMILY & BLESSING – they build upon one another in the sense of achieving (or receiving technically), indeed it is a Blessing to have a Home and Family. It may sound trivial to some, but when we consider what we deserve verses what we actually have, most Christians are VERY BLESSED people. But, we also must correctly see what has been the largest moral breakdown of the family in my lifetime in my opinion – the absolute DESTRUCTION of the Family and the very FABRIC of the Home is being stained by our inability to slow down the onslaught at every corner of impurity, immorality, and sheer violence. It is my desire to have the section heading question asked of me and in my house because it is my desire to point those who would ask to the One Who can change Eternity for them because He PAID for IT – the Lovely Lord Jesus Christ! In reading through the rest of the site for this Series, One will find six (6) different sets within a set of images which share verses of Scripture from God’s Holy Word. It is my desire that this set will challenge you as much as it has me to start something, like starting a conversation with another person where there is freedom to discuss Spiritual matters that are of Eternal length! 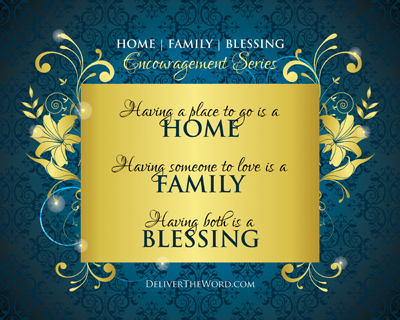 The following listed items are really all that it took for this Series to be born into existence: HOME | FAMILY | BLESSING. Following those are the five (5) phrases that are realized in the verses presented in support as the following words: Truth, Walk, Declare, Speak and Shield. This Series will most likely strike a cord with most people because it is something that each of us has had to go through at one time or another – a personal storm. Some may call it a personal “trial” or “situation” or could be referred to as a “season” of life when spoken of as a longer period of time or maybe experiencing an illness or disease. This Series has been developed from a Revival Service at our home church from a first of the year kick start thought of “Start Off Right Revival Sunday Nights” for the month of January. This particular kick-start has to do with the very subject of “When Facing Storms” in our lives, seeing what God’s Word has to say about the matter and how we can make application in our lives today, just as they did way back when it was first written. It has been said that the success or failure of a mission or project can be determined by an experienced leader before the first step, action or idea has ever been put into motion. Most of the time that leader has had a great deal of experience at working through the set of problems, challenges or tasks that are placed before them in which to pull from – a knowledge-base of sorts. Not always does this have to be the case though, we as Christians do not have to be the leader in those situations by ourselves, that is because we have One Supreme Father God who will guide us, if we are willing to be led. No where in God’s Holy Word will it be found that Christian’s will have endless piece, perfect harmony and live prefect/sinless lives after we accept Jesus Christ as our Lord and Saviour. But what we do have are the promises that He loves us, will protect us and will never leave, nor forsake us as His children. This Series is about that very thing – where we will find ourselves in the storm we call life and where we can find Him, which is NOT far away. What we feed into our minds is what will so easily pour out – those cascades of words should be of love and concern, not matter where we find ourselves. This Series is comprised of several pieces which can all be thought of as Storm Reminders, for that is truly what they are. These Reminders are presented in the form of Definitions, Phrases, Prints and a single Hymn, all of which encompass the concept of Refuge and Safety – two things all of us desire in a Storm. Each of us face Storms in our lives which will encompass various parts past, present and future lives. Some of them will be more emotional than others. Others will be more physical in nature than others. Still, yet there will be some that test our Faith to limits we previously thought was impossible. Given all that, we must remember this, EVERY one of them is a Spiritual Storm – our dependence on our Faith will be greatest work of all. How would I know this? Simple, I’ve just come through one of those storms in my life – one that has many pieces, involves a number of people, with outcomes that will show through as pure as I want it to show. 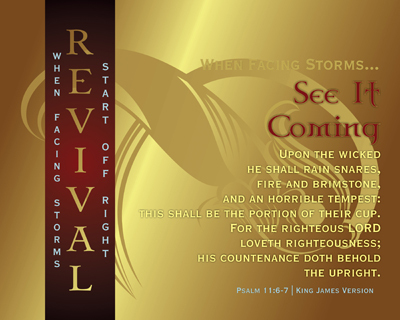 Each of those Storm Reminders have been lived through and will continue for some time further and will serve as a reminder to me that my dependence on my Lord and Saviour reigns Supreme – all else is of no value to Him. What kind of Storm are you experiencing today? Do some of these Reminders remind you of things you are currently living within? Who will you run to for help? There is a Refuge and Safety provided for every Christian – Under His Wings – a special place with an abundance of Grace. Who is He? Jesus.